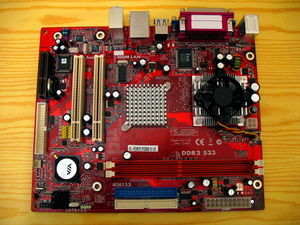 This page describes how to use coreboot on the VIA pc2500e mainboard. It is maintained by Uwe Hermann. Note that the via/pc2500e code will likely also work for the PC2000, PC2000e+, PC2500, PC2500e+, or PC2500g (though this is untested). DDR2 OK The CN700 code in svn currently only supports one DIMM. The RAM inserted in the second DIMM will not be usable. On-board IDE 3.5" OK The IDE device names in FILO are hde and hdf (hda, hdb, hdc, hdd are for SATA)! On-board VGA OK Works fine with the openchrome X.org driver. No VGA BIOS needed, no BOCHS needed! Audio/Modem-Riser (AMR/CNR) cards Untested There's a CNR header on the board. Sensors / fan control OK Works fine using the it87 kernel module. ACPI No No ACPI support (yet?) for this board. Poweroff No Doesn't work yet, probably requires (at least partial) ACPI support. High precision event timers (HPET) OK Using hpet=force on the Linux command line works, but it's unclear whether using the HPET is better or not. Random number generator (RNG) OK Doing modprobe via-rng works fine, further test were not performed, yet.